Kellihan H.B., Waller K.R., Pinkos A., Steinberg H., Bates M.L. Acute resolution of pulmonary alveolar infiltrates in 10 dogs with pulmonary hypertension treated with sildenafil citrate: 2005-2014 // J Vet Cardiol. 2015 Sep;17(3):182-91. OBJECTIVE: To describe clinical canine patients with naturally occurring pulmonary hypertension and radiographic pulmonary alveolar infiltrates before and after treatment with sildenafil. METHODS: A retrospective analysis of dogs with echocardiographically-determined pulmonary hypertension and pulmonary alveolar infiltrates on thoracic radiographs was performed before (PRE) and after (POST) sildenafil therapy. Clinical scores, pulmonary alveolar infiltrate scores and tricuspid regurgitation gradients were analyzed PRE and POST sildenafil. 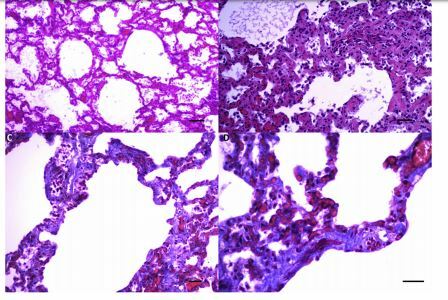 RESULTS: Pulmonary alveolar infiltrates associated with pulmonary hypertension developed in a diffusely patchy distribution (10/10). Sixty percent of dogs had a suspected diagnosis of interstitial pulmonary fibrosis as the etiology of pulmonary hypertension. Median PRE clinical score was 4 (range: 3-4) compared to POST score of 0 (0-2) (p = 0.005). Median alveolar infiltrate score PRE was 10 (5-12) compared to POST score of 4 (0-6) (p = 0.006). Median tricuspid regurgitation gradient PRE was 83 mmHg (57-196) compared to 55 mmHg POST (33-151) (p = 0.002). CONCLUSIONS: A subset of dogs with moderate to severe pulmonary hypertension present with diffuse, patchy alveolar infiltrates consistent with non-cardiogenic pulmonary edema. The typical clinical presentation is acute dyspnea and syncope, often in conjunction with heart murmurs suggestive of valvular insufficiency. 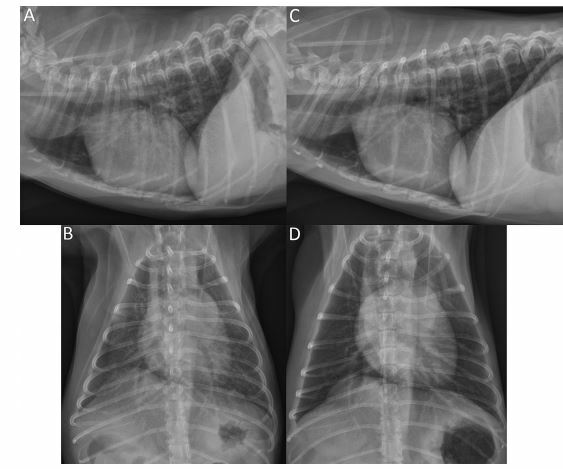 This constellation of signs may lead to an initial misdiagnosis of congestive heart failure or pneumonia; however, these dogs clinically and radiographically improve with the initiation of sildenafil. Pulmonary hypertension (PH) is sequelae to multiple disease processes and is primarily diagnosed in older, small breed dogs. Pulmonary hypertension can be classified as increased pre-capillary resistance (pulmonary arterial hypertension) or increased post-capillary resistance (pulmonary venous hypertension) and the causes of PH are numerous and associated with a multitude of different diseases.1—16 The clinical presentation of dogs with PH includes cough, exercise intolerance, respiratory distress, and/or syncope.1,2 This presentation is similar to, and maybe mistaken for, primary respiratory pathology and/or congestive heart failure. For this reason, many dogs with abnormal clinical signs resulting from pulmonary hypertension (PH) are treated for primary respiratory infection or airway inflammation with antibiotics and steroids, and diuretics for congestive heart failure. The diagnosis of PH in the clinical canine population is made echocardiographically and defined as an estimated pulmonary arterial systolic pressure greater than 30 mmHg.17 Thoracic radiographs are often evaluated and frequently demonstrate the consequences of long-term pulmonary hypertension (PH), including pulmonary arterial and right-sided heart enlargement. In veterinary medicine, pulmonary alveolar infiltrates are often the result of left-sided heart failure or pneumonia and not typically thought to be associated with pulmonary hypertension (PH). However, in humans, PH associated with high altitude exposure can result in patchy pulmonary edema and radiographic infiltrates. Treatment with sildenafil citrated improves these patients’ PH severity, pulmonary edema and adverse clinical signs.18 The occurrence of pulmonary alveolar infiltrates associated with PH in dogs is not well described in the scientific literature and may be an under-recognized clinical feature of pulmonary hypertension (PH). The purpose of this study was to describe a series of dogs with naturally occurring PH and radiographic alveolar infiltrates before and after treatment with sildenafil. Medical records from the teaching hospital of the University of Wisconsin School of Veterinary Medicine were reviewed for canine patients with concurrent radiographic evidence of pulmonary alveolar infiltrates, moderate to severe pulmonary hypertension based on echocardiographic examination, and treatment with sildenafil citrate from June 2005 through March 2014.
d Viagra and Revatio, Pfizer US Pharmaceuticals, New York, NY, USA. included recent heartworm testing, 3-view thoracic radiographs both pre-sildenafil treatment (PRE) and post-sildenafil treatment (POST) and echocardiograms PRE and POST that included estimated systolic pulmonary artery pressures (sPAP) based on peak tricuspid regurgitation (TR) flow gradients. The POST echocardiograms did not always coincide with the timing of the POST thoracic radiographs. Ten patients fit the inclusion criteria and were included in the analysis. Signalment, presenting complaint, clinical signs, physical examination and owner’s assessment of well-being were extracted from the medical files at presentation and at the first recheck POST. All dogs were given a clinical score at the time of initial presentation (PRE) and at their first recheck appointment after starting sildenafil (POST). The clinical score analysis has been previously described in a population of dogs with pulmonary hypertension (PH) treated with sildenafil.1 Scores were based on clinical presentation (0—2) and owner’s assessment of the dog’s well-being (0—2) with a maximum score of 4. For clinical presentation, a score of 0 represented no clinical signs, 1 represented identifiable signs but mild—moderate impact on daily life, and 2 represented overt clinical signs (exercise intolerance, syncope, respiratory distress, cough). Owner’s assessment was scored as 0 representing an unaffected dog, 1 representing a good quality of life and 2 representing a poor quality of life. Thoracic radiographs were evaluated by a board-certified veterinary radiologist (KRW) blinded to PRE and POST status. Vertebral heart score (VHS) was recorded from the left lateral radiograph in all dogs. The ventral—dorsal radiograph of each dog was evaluated PRE and POST for severity of pulmonary alveolar infiltrates. The radiographs were scored based on a modified Murray Lung Injury Score validated in humans with pulmonary edema and adult respiratory distress syndrome.19,20 The lung fields were divided into 4 quadrants by a vertical line made starting at the middle of the trachea from the thoracic inlet and continued through the middle of the thorax as well as a horizontal line drawn perpendicular to the vertical line through the center of the carina (Fig. 1). The left cranial, left caudal, right cranial and right caudal quadrants were assigned as quadrant 1, 2, 3 and 4, respectively. Each quadrant was given a score of 0—4 with 0 representing no pulmonary alveolar infiltrates, 1 representing pulmonary alveolar infiltrates in 0—25% of the quadrant, 2 representing pulmonary alveolar infiltrates in 25—50% of the quadrant, 3 representing 50—75% of the quadrant, and 4 representing 75—100% of the quadrant. The total number from each quadrant was then combined for a total possible score of 16. Standardized transthoracic echocardiogramse,21 were performed in right and left lateral recumbent positions using a phased-array 5.0 MHz frequency transducer by a board-certified cardiologist or a cardiology resident under direct supervision of a boarded cardiologist. All echocardiograms were reviewed by a single cardiologist (HBK). Complete echocardiographic studies were performed PRE and either full or abbreviated echocardiograms were performed POST. Peak TR velocity was used, in all cases, to calculate estimated sPAP and this measurement was obtained by interrogation of the most optimally-aligned TR jet from the right or left sided views, as previously described.22 Mild pulmonary hypertension (PH) was classified as estimated sPAP of 30—50 mmHg, moderate as 51—75 mmHg, and severe as >75 mmHg. Complete echocardiograms were performed in all cases, if possible, and included subjective evaluation of the right atrium and ventricle as well as septal motion. The ratio of the left atrium (LA) to the aortic root (Ao) was measured and recorded in all dogs prior to sildenafil treatment to assess for evidence of left atrial enlargement.23 Ratios <1.5 were considered normal and >1.5 were considered dilated. The presence or absence of mitral regurgitation (MR) and severity were recorded in all dogs PRE. Data analysis was performed using standard statistical software/ All variables were analyzed with nonparametric methods due to the small numbers of dogs. Wilcoxon signed rank test was used to compare heart rate, respiratory rate, clinical score, radiographic scores, and echocardiographic data PRE and POST. Significance was set at p <0.05 for all tests. Results are given as the median and range for all values. e Vivid 7 Echocardiographic System, General Electric, Waukesha, WI, USA. f GraphPad Prism 5.0b, GraphPad Software Inc, San Diego, CA, USA. On the ventral—dorsal view each quadrant is given a score: 0, no edema; 1, edema in 0—25% of quadrant; 2, edema in 25—50% of quadrant; 3, edema in 50—75% of quadrant; 4, edema in 75—100% of quadrant. Panel A: This dog’s (dog #5) PRE ventral—dorsal thoracic radiograph score total was 8 (quadrant 1: 2, quadrant 2: 2, quadrant 3: 2, quadrant 4: 2). Panel B: The same dog’s POST ventral—dorsal thoracic radiograph score total was 0 six days after initiation of sildenafil treatment. Descriptive characteristics of all 10 dogs are presented in Table A (data available in Supplemental Data online). The median age of the dogs at diagnosis was 13 years (range: 2—22 years) and the median weight was 5 kg (range: 2.6—11.4 kg). All dogs were referred to the UW Veterinary Care Cardiology service for suspected cardiac or respiratory disease. Prior to presentation, 7 of 10 dogs (70%) had been treated with furosemide and 4 of 10 (40%) had been treated with antibiotics without clinical improvement. The most common presenting complaint was respiratory distress (9/10), followed by syncope (6/10). Other signs included cough (3/10) and exercise intolerance (1/10). Seven of 10 dogs required oxygen therapy on presentation and despite the variable amount of time each dog was exposed to oxygen supplementation, none of the dogs showed sufficient improvement on oxygen therapy alone. Clinical scores were obtained at the first recheck examination after discharge in all dogs and the median follow-up time was 9 days (range 3—36 days). Once a tentative diagnosis of PH was made, sildenafil was administered orally to all dogs. The median sildenafil dose was 1.0 mg/kg PO q 8 h (range: 0.5—2.0 mg/kg). The median POST clinical score was significantly lower compared to PRE clinical scores (Table 1 and Fig. 2). No other medications were administered between PRE and POST thoracic radiographs, including furosemide. Murmurs were auscultated in 7/10 dogs (70%) PRE. Five dogs had left and right apical systolic murmurs auscultated, ranging from a grade II/VI to V/VI. One dog had only a left apical systolic murmur and one dog had a continuous bruit auscultated over the right dorsal, cranial thorax. The remaining 3 dogs (30%) had no abnormalities on cardiovascular auscultation. Three dogs (30%) had a normal respiratory auscultation PRE and POST. Four dogs (40%) had diffuse pulmonary crackles PRE compared to 7 dogs (70%) POST. Three dogs (30%) had harsh bronchovesicular sounds at presentation. Four dogs (40%) had cyanotic mucous membranes PRE compared to no dogs at POST. Heart rates and respiratory rates PRE and POST were significantly different and are displayed in Table 1. * indicates significance (p < 0.05). Electrocardiograms were performed on 7/10 patients at presentation. Three dogs had right axis deviation and 1 dog had a left ventricular enlargement pattern. A single dog had a solitary atrial premature complex and 2 dogs had sinus tachycardia. Thoracic radiographic analysis PRE displayed varying degrees of patchy, alveolar infiltrates (Figs. 1 and 3). Post-sildenafil treatment thoracic radiographs were performed between 1 and 12 days with a median of 3.5 days (Figs. 1 and 3). Presildenafil treatment, subjective left atrial enlargement was noted in two dogs, mild right atrial enlargement was noted in 5 dogs and moderate right sided enlargement in 2 dogs. Postsildenafil treatment, subjective cardiac enlargement remained unchanged. Pulmonary vasculature size was within normal limits on all dogs PRE and POST. Median alveolar infiltrate score POST was significantly improved compared to PRE and median VHS PRE and POST were not significantly different (Table 1 and Fig. 4). Post-echocardiograms were performed a median of 8 (range: 1—47) days after the initial diagnostic echocardiogram. All dogs that were administered oxygen therapy at presentation were echoed with oxygen supplementation during the examination. Echocardiograms after sildenafil treatment were performed with or without oxygen supplementation. No dog had a PRE echocardiogram without oxygen supplementation and a subsequent POST echocardiogram with oxygen supplementation. On the PRE exam, 5 dogs had mild MR and 1 dog had moderate MR secondary to myxomatous mitral valve disease. The median LA/ Ao was 1.4 (range: 1.1—1.9). On presentation, subjective right-sided chamber dilation (atrial or ventricular) was noted in 9 of 10 dogs, right ventricular concentric hypertrophy was present in 4, and septal flattening was present in 5 dogs. Estimated sPAP pressures significantly decreased POST compared to PRE as shown in Table 1 and Figure 5. The diagnosis of pulmonary hypertension (PH) was made based on echo- cardiographic findings. All dogs were heartworm negative and none had a history of heartworm infection. Six dogs (60%) were suspected to have PH secondary to idiopathic interstitial pulmonary fibrosis (IPF). This tentative diagnosis was made based on the lack of significant left-sided heart disease, the absence of intra- or known extracardiac shunts, the absence of historical or current heartworm infection, the absence of concurrent disease states known to predispose to a hypercoagulable state, and the presence of pulmonary crackles in conjunction with no pulmonary infiltrates on POST thoracic radiographs. One dog’s diagnosis of IPF was confirmed at necropsy (Fig. 6). An additional dog was diagnosed with a history of chronic respiratory disease because there were clinical signs of primary respiratory disease with no pulmonary crackles, but was suspected to likely have IPF as crackles were heard on subsequent examinations. Two dogs were classified as having idiopathic PH based on ruling out all other causes of pulmonary hypertension (PH) and having no crackles appreciated on POST physical examination, and one of these dogs had a concurrent suspect pulmonary arteriovenous malformation. One dog had thrombelastography results suggestive of hypercoagulability; pulmonary thromboembolism was then concluded to be a likely cause of the PH. At the time this manuscript was written (7/7/ 2014) 3 dogs were alive, 6 died or were euthanized and 1 was lost to follow up (Table 1). The median time to final outcome was 249 (range: 36—803) days. 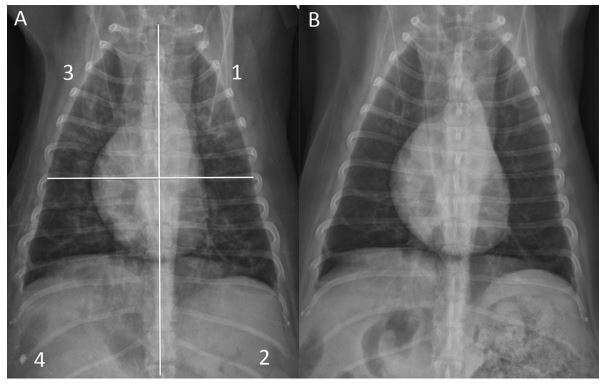 Figure 3 Thoracic radiographs PRE and POST sildenafil treatment for dog #8. Panel A: PRE lateral thoracic radiograph. Panel B: PRE ventral—dorsal thoracic radiograph; score = 11. Panel C: POST lateral thoracic radiograph taken 1 day after sildenafil treatment was implemented. Panel D: POST ventral—dorsal thoracic radiograph taken 1 day after sildenafil treatment was implemented; score = 0. None of the dogs in this study had evidence of significant left-sided heart disease (enlarged pulmonary vasculature and subjective assessment of left atrial enlargement on thoracic radiographs) or pneumonia (all dogs were acutely dyspneic and normothermic) or a history of disease states predisposing to hemorrhage, and none had a history of events known to result in noncardiogenic edema formation. Based on the authors’ assessment of mild left atrial changes in dogs with myxomatous mitral valve disease, it is unlikely that pulmonary venous hypertension contributed to pulmonary alveolar infiltrate formation. As further evidence that left-sided congestive heart failure or pneumonia was not the cause of the pulmonary alveolar infiltrates observed in these patients, 7/10 were initially treated with furosemide and 4/10 were initially treated with antibiotics with no clinical or radiographic improvement, but all had moderate to severe pulmonary hypertension (PH) on presentation. There were several underlying disease processes causing PH in our mixed cohort of clinical patients. Yet, the fact that each presented with patchy alveolar infiltrates, compared to global edema or pulmonary hypertension without edema, suggests a common pathophysiological mechanism. Specifically, we hypothesize that patchy edema in our patients is caused by non-uniformity in pulmonary capillary perfusion in which some capillary beds are over-perfused relative to others. An analogous mechanism is the development of high altitude pulmonary edema (HAPE) in humans with acute, hypoxia-induced pulmonary hypertension (PH). High altitude pulmonary edema is a potentially life-threatening condition that occurs in apparently healthy individuals that ascend to altitudes above 2500 m without sufficient acclimatization.25 Like the dogs presented here, human patients with HAPE present with cough and dyspnea, normal left atrial pressure, and a high pulmonary arteriolar, or precapillary, resistance. Also, similar to the cases presented here, a hallmark sign of HAPE is patchy pulmonary alveolar infiltrates. Although the pathophysiology of HAPE is complex, the high pulmonary arterial pressure is the result of hypoxia-induced pulmonary arterial constriction. The pulmonary arterial bed can have varying constrictive responses to hypoxia.26 There is a large pressure drop across the capillary bed undergoing an extreme arteriolar vasoconstrictor response. This increase in resistance is protective and limits the pressure transmitted to the downstream capillaries.27 Blood flow is inversely proportional to resistance; accordingly, blood flow is diverted to the less constricted vascular bed, which is less resistant to blood flow. The capillaries in the poorly constricted region experience higher hydrostatic pressure and alveolar membrane integrity is compromised, resulting in edema formation with high protein and high red blood cell composition.28 Patchy pulmonary alveolar infiltrates in the dogs of this report, with moderate to severe pulmonary hypertension (PH), may also be arising as a result of focal over-perfusion of select capillary beds, comparable to HAPE. The reduction of infiltrates by sildenafil suggests that it may reduce perfusion heterogeneity, thereby relieving the hydrostatic pressure in over-circulated areas. Future investigation into this potential mechanism warrants investigation. TR, tricuspid regurgitation. * indicates significance (p < 0.05). 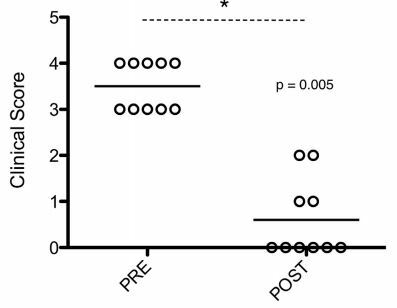 In comparison, the formation of typical noncardiogenic pulmonary edema results from increased pulmonary vascular endothelial permeability secondary to lung injury, often accompanied by concurrent alveolar epithelial damage.29 Since the lung injury (i.e. inhalation of caustic agents, aspiration pneumonia, sepsis, pancreatitis, reexpansion injury mediated by ischemia and reperfusion, neurogenic sympathetic stimulation, postobstructive causes involving excessive negative intrathoracic pressures, systemic inflammatory response syndrome, uremia, anaphylaxis) in typical non-cardiogenic pulmonary edema is often global, the distribution of the edema tends to be diffuse and uniform.29,30 The dogs in the present study had patchy alveolar infiltrates with a mechanism of infiltrate formation inconsistent with typical noncardiogenic pulmonary edema and mechanistically thought to be more similar to HAPE. Cardiogenic pulmonary edema, as seen when the left ventricle fails, develops secondary to the high diastolic pressure transmitted backward to the left atrium, the pulmonary veins and the pulmonary capillaries.27 Because there is no vasoconstriction of the pulmonary venous circulation, this high hydrostatic pressure is translated uniformly to the capillaries and pulmonary alveolar infiltrates are, likewise, more uniform in appearance. Panel A: Hematoxylin and eosin stain, 20x magnification. The alveolar septae are variably thickened and frequently contain edema with admixed cellular accumulations within air spaces; bar = 100 mm. Panel B: Hematoxylin and eosin stain, 100x magnification. An area of atelectasis with thickened alveolar septae is shown with increased deposits of fibrillar eosinophilic material (collagen); bar = 30 mm. Panel C: Trichrome stain, 100x magnification. Thickened alveolar septae are seen with increased deposits of blue-stained collagen; bar = 30 mm. Panel D: Trichrome stain, 200x magnification. Thickened alveolar septae are seen with increased deposits of blue-stained collagen; bar = 30 mm. Thus, because of the important differences in the pathophysiology of the pulmonary alveolar infiltrate formation, we propose that the thoracic radiograph and the complete clinical picture may be a valuable tool to the veterinarian in discriminating between pulmonary arterial hypertension and congestive heart failure. Sildenafil therapy had a positive impact on these dogs’ clinical signs and quality of life, improved or resolved the pulmonary alveolar infiltrates, and ameliorated the pulmonary hypertension. Sildenafil is a selective phosphodiesterase V inhibitor and promotes pulmonary artery vasodilation through an increase in cGMP and has been shown to improve hypoxia-induced pulmonary hypertension (PH) in people and animal models of PH31 and may have long-term beneficial effects in other disease processes that cause PH. The efficacy of sildenafil in these cases suggests that their pulmonary hypertension (PH) was not caused exclusively by a fixed increase in pulmonary vascular resistance, but that there may be a substantial degree of reactive vasoconstriction. By relieving this vasoconstriction, sildenafil could potentially serve to improve pulmonary alveolar infiltrates by decreasing overperfusion to edematous areas. Sildenafil may be a valuable first-line treatment in dogs with patchy pulmonary alveolar infiltrates secondary to pulmonary hypertension (PH). This study was subject to a number of limitations that are typical of a retrospective study and the true prevalence of pulmonary alveolar infiltrates associated with PH, during the period studied, is not known. The number of dogs with pulmonary crackles was higher after treatment with sildenafil, which may be attributable to interobserver variation in the identification of auscult- able crackles or that pulmonary crackles may have been impeded by loud adventitial sounds on the PRE examination. The lack of a control group that did not receive sildenafil is a limitation to this study, although the clinicians involved in these cases felt it would be ethically unsound to withhold the perceived standard of care for clinical PH in this population of patients. 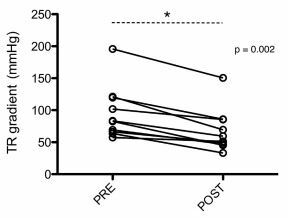 A control group that didn’t receive sildenafil could have elucidated that time, rest and oxygen supplementation alone may have resolved the alveolar infiltrates. Tricuspid regurgitation gradients were used as surrogates of PH severity and this method of obtaining accurate pulmonary artery pressures is fraught with incon- sistencies.32 Unfortunately, only a single dog in this study had histopathology performed and no dogs had computed tomography performed to more definitely diagnose the pulmonary hypertension (PH) etiology and error in making the correct diagnosis may have occurred. Last, this manuscript describes the development of pulmonary alveolar infiltrates in dogs with PH being treated with sildenafil during a very limited time frame and does not describe the long term follow-up, including the possible recurrence of pulmonary alveolar infiltrates. Pulmonary alveolar infiltrate formation can occur in dogs with pulmonary hypertension (PH) and the typical presentation is acute dyspnea with syncope and the presence of valvular insufficiency murmurs. The PH severity associated with pulmonary alveolar infiltrates is moderate to severe and results in diffuse, patchy alveolar infiltrates. These infiltrates are often misdiagnosed as cardiogenic pulmonary edema or pneumonia and fail to response to conventional therapy for both. Sildenafil citrate is well tolerated and improves pulmonary alveolar infiltrates and clinical signs in this population of dogs. The authors gratefully acknowledge Drs. Rebecca Stepien and Lydia Soydan for reviewing the manuscript. Kellum HB, Stepien RL. 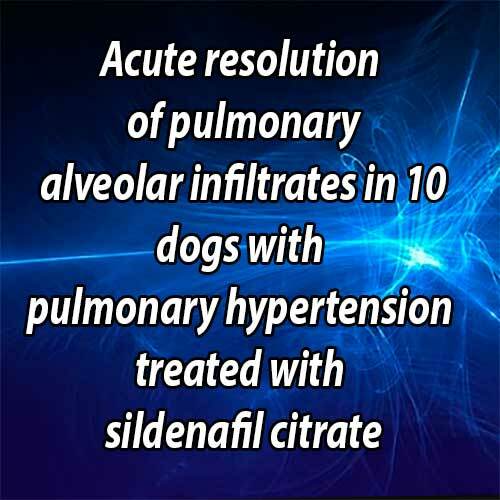 Sildenafil citrate therapy in 22 dogs with pulmonary hypertension. J Vet Intern Med 2007;21: 1258-1264. Bach JF, Rozanski EA, MacGregor J, Betkowski JM, Rush JE. Retrospective evaluation of sildenafil citrate as a therapy for pulmonary hypertension in dogs. J Vet Intern Med 2006; 20:1132-1135. Schober KE, Baade H. Doppler echocardiographic prediction of pulmonary hypertension in West Highland white terriers with chronic pulmonary disease. J Vet Intern Med 2006;20: 912-920. Pyle RL, Abbott J, MacLean H. Pulmonary hypertension and cardiovascular sequelae in 54 dogs. Intern J Appl Res Vet Med 2004;2:99-109. Simonneau G, Galie N, Rubin LJ, Langleben D, Seeger W, Domenighetti G, Gibbs S, Lebrec D, Speich R, Beghetti M, Rich S, Fishman A. Clinical classification of pulmonary hypertension. J Am Coll Cardiol 2004;43:5S-12S. Zabka TS, Campbell FE, Wilson DW. Pulmonary arteriopathy and idiopathic pulmonary arterial hypertension in six dogs. Vet Pathol 2006;43:510-522. Hirano Y, Kitagawa H, Sasaki Y. Relationship between pulmonary arterial pressure and pulmonary thromboembolism associated with dead worms in canine heartworm disease. J Vet Med Sci 1992;54:897-904. Russell NJ, Irwin PJ, Hopper BJ, Olivry T, Nicholls PK. Acute necrotising pulmonary vasculitis and pulmonary hypertension in a juvenile dog. J Small Anim Pract 2008;49: 349-355. Pyle RL, Park RD, Alexander AF, Hill BL. Patent ductus arteriosus with pulmonary hypertension in the dog. J Am Vet Med Assoc 1981;178:565-571. Johnson LR, Lappin MR, Baker DC. Pulmonary thromboembolism in 29 dogs: 1985-1995. J Vet Intern Med 1999; 13:338-345. Grover RF, Johnson RL, McCullough RG, McCullough RE, Hofmeister SE, Campbell WB, Reynolds RC. Pulmonary hypertension and pulmonary vascular reactivity in beagles at high altitude. J Appl Physiol 1988;65:2632-2640. Glaus T, Soldati G, Maurer R, Ehrensperger F. Clinical and pathological characterisation of primary pulmonary hypertension in a dog. Vet Rec 2004;154:786-789. Glaus T, Hassig M, Baumgartner C, Reusch CE. Pulmonary hypertension induced in dogs by hypoxia at different high- altitude levels. Vet Res Commun 2003;27:661-670. Matos JM, Schnyder M, Bektas R, Makara M, Kutter A, Jenni S, Deplazes P, Glaus T. Recruitment of arteriovenous pulmonary shunts may attenuate the development of pulmonary hypertension in dogs experimentally infected with Angiostrongylus vasorum. J Vet Cardiol 2012;14:313-322. Chiavegato D, Borgarelli M, D'agnolo G, Santilli RA. Pulmonary hypertension in dogs with mitral regurgitation attributable to myxomatous valve disease. Vet Radiol Ultrasound 2009;50:253-258. Kellihan HB, Stepien R. Pulmonary hypertension in dogs: diagnosis and therapy. Vet Clin North Am Small Anim Pract 2010;4:623-641. Ghofrani HA, Reichenberger F, Kohstall MG, Mrosek EH, Seeger T, Olschewski H, Seeger W, Grimminger F. Sildenafil increased exercise capacity during hypoxia at low altitudes and at Mount Everest base camp: a randomized, double blind, placebo-controlled crossover trial. Ann Intern Med 2004;141:169-177. Murray JF, Matthay MA, Luce JM, Flick MR. An expanded definition of the adult respiratory distress syndrome. Am Rev Respir Dis 1988;138:720-723. Ware LB, Neyrinck A, O'Neal HR, Lee JW, Landeck M, Johnson E, Calfee CS, Matthay MA. Comparison of chest radiograph scoring to lung weight as a quantitative index of pulmonary edema in organ donors. Clin Transplant 2012;26: 665-671. Thomas WP, Gaber CE, Jacobs GJ, Kaplan PM, Lombard CW, Moise NS, Moses BL. Recommendations for standards in transthoracic two-dimensional echocardiography in the dog and cat. J Vet Intern Med 1993;7:247-252. Kellihan HB, Mackie BA, Stepien RL. NT-proBNP, NT-proANP and cTnI concentrations in dogs with pre-capillary pulmonary hypertension. J Vet Cardiol 2011;13:171-182. Hansson K, Haggstrom J, Kvart C, Lord P. Left atrial to aortic root indices using two-dimensional and M-mode echocardiography in cavalier King Charles spaniels with and without left atrial enlargement. Vet Radiol Ultrasound 2002;43:568-575. Cohn LA. Pulmonary parenchymal disease. In: Ettinger SJ, Feldman EC, editors. Textbook of veterinary internal medicine diseases of the dog and cat. 7th ed. St Louis: Saunders Elsevier; 2010. p. 1096-1119. Eldridge MW, Braun RK, Yoneda KY, Walby WF. 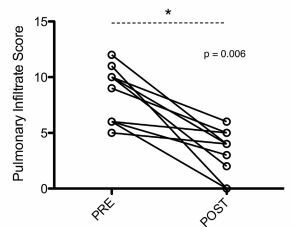 Effects of altitude and exercise on pulmonary capillary integrity: evidence for subclinical high-altitude pulmonary edema. J Appl Physiol 2006;100:972-980. Hultgren HN. High-altitude pulmonary edema: current concepts. Annu Rev Med 1996;47:267-284. Badeer HS. Hemodynamics for medical students. Adv Physiol Educ 2001;25:44-52. Bartsch P, Mairbaurl H, Maggiorini M, Swenson ER. Physiological aspects of high-altitude pulmonary edema. J Appl Physiol 2005;98:1101-1110. Murray JF. Pulmonary edema: pathophysiology and diagnosis. Int J Tuberc Lung Dis 2011;15:155-160. Bachmann M, Waldrop JE. Noncardiogenic pulmonary edema. Compend Contin Educ Vet 2012;34:E1. Zhao L, Mason NA, Morrell NW, Kojonazarov B, Sadykov A, Maripov A, Mirrakhimov MM, Aldashev A, Wilkins MR. Sildenafil inhibits hypoxia-induced pulmonary hypertension. Circulation 2001;104:424-428. Kellihan HB, Stepien RL. Pulmonary hypertension in canine degenerative mitral valve disease. J Vet Cardiol 2012;14: 149-164.